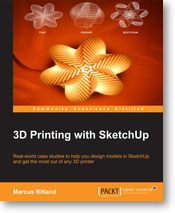 Packt Publishing has released a new book by Marcus Ritland entitled 3D Printing with SketchUp. Marcus shares numerous strategies and techniques, along with real-world examples, to help anyone prepare printable 3D models in SketchUp. Techniques include setting up templates, toolbars, and extensions to speed up model making and preparation for 3D printing. Other useful information includes details about the various 3D printing methods and their relative [dis]advantages, and links to resources. If you're new to 3D printing, you should definitely check out this book!